Halfway to a marathon, and not 40 yet. 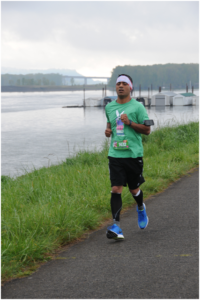 The Hop-Hop Half Marathon course is an out-and-back along the levee that separates Portland’s mile-wide Columbia River from the airport. If Shamrock was hilly, this was about as flat as it gets. I think we climbed up and down off the levee, once. The day of the race was cloudy and cold — perfect running weather! I started the run, again in the finisher’s shirt — my friend Gregg didn’t tell me about race-shirt-etiquette until later in that first year. Feeling strong, fast, and confident, I glanced at the GPS app on my phone — 4:38 min/kim (7:30 min/mile) pace! Oops. However confident I might be, I wasn’t that strong and fast. So I slowed a bit, ignoring pace goals and enjoying the run along the river. 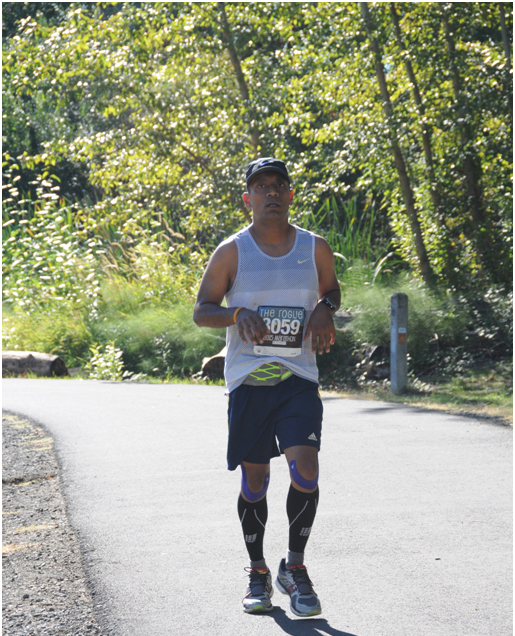 Running next to the Columbia River during my first half-marathon, the Hop Hop Half Marathon, April 2015. Around 16 km (10 miles) in, I realized that I would be finishing my first half-marathon. I still wasn’t paying attention to the time, just trying to go as fast as I could. I crossed the finish line and collected my medal, then checked the results — I finished at 1 hour 49 minutes and 6 seconds (1:49:06), well under my goal of 2 hours, and at a pace of 5:11 min/km (8:19 min/mile). A month later, I ran my third race, the Rock n’ Roll Portland Half Marathon, with a similar time (1:49:57). With Mike and Gregg after the Crawfish Crawl Half Marathon, 2015. Gregg pulled me aside around the time this photo was taken and educated me on race shirt etiquette. But I was hooked. Three months later, I ran Hood to Coast with Ron’s team. A month before Hood to Coast, Gregg took me aside at the end of the Crawfish Crawl Half Marathon and pointed out that I really ought to stop wearing finisher’s shirts during the race. 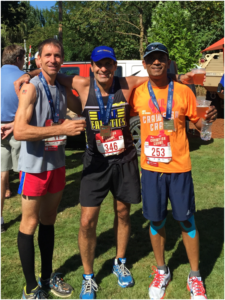 Hood-to-Coast, and a sub-4-hour-marathon. Still not 40! Hood-to-Coast is a relay race that starts above timberline on the slopes of Oregon’s 3,429 meter (11,249-foot) Mt. Hood and makes its way through downtown Portland to the Oregon coast over a distance of 199 miles. It is the subject of a documentary, “Hood to Coast,” available on Amazon Prime. During the course of two days, you encounter breathtaking scenery, scorching sunshine, dusty midnight runs, and a lot of time in a van full of smelly runners. I had a lovely time running it with team “Wanna-Beer? Sher-Wood!”, named for the Portland suburb of Sherwood, Oregon, where the bulk of the team-members lived. Sometime in the middle of the year, I also hit my weight goal, and noted that as I lost weight, my running got better, with fewer aches and pains. Group runs with the HTC team meant I no longer listened to music (because I was forced to socialize), a habit that stuck with me on solo runs. I ran additional half-marathons … and then decided to turn the dial to 11, moving up to the marathon. My training plan wasn’t one I’d now recommend to beginners. The guide I chose it from called it “intermediate,” but today my club coach calls it “wildly ambitious,” if not stupid. A key part of it was a 41.5-km-run (26 miles) three weeks prior to the goal race, almost the full distance for a marathon (42 km or 26.2 miles). Even then I realized that this carried a chance I might injure myself, so I signed up for not one but two marathons, two weeks apart (more ambition! ), with the first taking the place of the last long run. That way, if I got hurt finishing the first run and couldn’t do the goal race, at least I’d have one marathon finished prior to turning 40! The two races I chose were the Rogue Run and the Portland Marathon, with the latter being my goal race. The Portland Marathon was still a couple of months prior to my 40th birthday. No midlife crisis here! I was becoming a marathoner while still younger than the age where I would continue not being able to afford a Ferrari. On the course at the Rogue Run Marathon. Coming in to the finish at the Rogue Run, desperately trying to make it under 4 hours. the Rogue Run, I’d only managed to complete a single 32 km (20-mile) run prior to the race (you’re supposed to run at least two or three). I set out at a 3 hour and 40 minute pace in the Rogue Run, and bonked around mile 16. “Bonked” is one of those sports terms that’s fairly self-descriptive, and pretty much describes how it feels when you suddenly run out of energy. In addition, the heat started being a problem — while the race started in cool early morning weather, within an hour it was uncomfortably warm as the sun made its presence felt. I switched to a mix of running and walking, and made it to 40 km (25 mile), where the pacer for the 4-hour-group caught up to me. The thought of missing my “B” goal of being under 4 hours got some adrenaline going, and I willed myself to stay ahead of the pacer for the next 2000 m. Fighting pain and fatigue, I managed to cross the finish at 3:59:18. The Portland Marathon was still a couple of months prior to my 40th birthday. No midlife crisis here! I was becoming a marathoner while still younger than the age where I would continue not being able to afford a Ferrari. 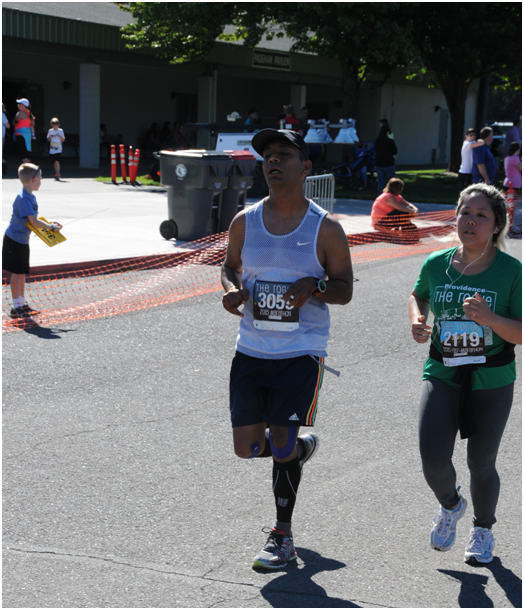 My daughter was at the finish waiting to take a picture, but didn’t see me, so I bought official race photos much later, and the finish line photo depicts my exhaustion pretty accurately. While I seem to remember long stretches of walking, when I look at the data from my running watch, it wasn’t as bad as I thought — most of it was just slower running with a few seconds of walking. Two weeks later, I limped across the finish line at the Portland Marathon in over 4:30, not having recovered from the Rogue Run. But now, I knew what to not do … and running two marathons that close together was top of the list! (I know some people who do, but clearly this was not for me). For the next month, I worked with a physiotherapist to improve core strength and leg strength, and resumed running after I recovered. 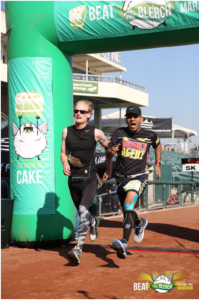 I managed to improve my half-marathon time to 1:43:57 at a November race called the Hot Buttered Run (first time under 5:00 min/kim or 8:00 min/mile), two days before I turned 40. Two weeks later, I celebrated my 40th birthday again by improving that time to 1:40:36 at the Holiday Half. The 2015 Holiday Half was also the race where US Olympian Galen Rupp qualified for the 2016 Olympic Marathon trials by finishing ahead of me, in a time of 1:01:20. His running was almost poetic, and I saw him twice on the course after the start. The first when he glided past me, not seeming to touch the ground, on his way back. I saw him again during his cool down as I was still two miles from the finish. I like to think his first place finish was facilitated by my letting him win. Rupp went on to win a bronze medal for the marathon in the 2016 Olympics, sealing my place in US Olympic history. You’re welcome, Galen. The more I ran and raced, the more I realized it was keeping me sane. Distance running is an excellent way to explore the physical and mental limits of your body as you push yourself to complete a long run. The more I ran and raced, the more I realized it was keeping me sane. Distance running is an excellent way to explore the physical and mental limits of your body as you push yourself to complete a long run. Running became a way to empty my mind. Work deadlines were not a priority for an hour or two while I struggled to finish a long run. Other training — like trail runs, hill repeats, and intervals — were to make it even more interesting. I ended 2015 with a tally of two 5k races, ten half marathons, and two marathons. 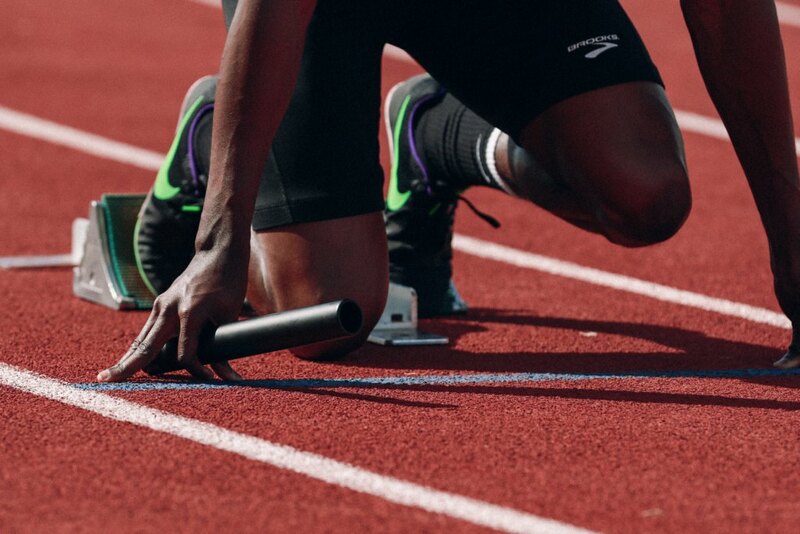 My first year of running had set up 2016 to be a fun year because I was getting stronger, and each race was an opportunity to set a new personal record. So I indulged in as many races as I could, signing up for a race almost every other weekend — 35 in total. As an added bonus, both my kids started running, and my older daughter and I signed up for the Oregon Road Running Club’s 10k series in 2016 (I ran longer distances at some events), and the younger one joined us for the 5k races at some events. Rohit Grover [B.Tech. 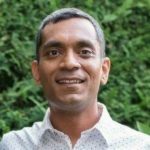 EP '97, H5] is a quality and reliability manager at a large semiconductor manufacturer. He and his wife, Priya Jamkhedkar [M.Sc. Physics '97, H10] live near Portland, Oregon, with two daughters, and a slightly evil cat named Sisco. Rohit also runs.